The importance of having a working septic system is vital for any home. Having your septic tank pumped on a regular basis can help to avoid any major ruptures in the tank, which can be costly and inconvenient. Clogged shower drains are a common occurrence and can be relatively simple to fix with at-home solutions. If you are considering installing a septic system, this article is for you. In this blog post we’ve highlighted the legal, financial, and environmental risks associated with incorrect septic system installation. Pipes that are unprepared for temperatures this low are at risk of freezing and rupturing. Knowing how to keep pipes and a septic system from freezing can save you a fortune. While the need to pump a septic tank varies by use, most septic tanks are designed to only need service once every few years. However, overuse or misuse of your home’s septic system can lead to a system backup, clog, or flood. Septic system problems are easily avoided though by knowing what is considered regular use. Here are four easy ways to ensure your next pump is a result of natural need and not costly, time consuming septic tank misuse. Septic tanks are pretty much-holding tanks that break down biodegradable waste and filter it out of the tank as bacterially cleaned waste water. However, as non-biodegradable sludge fills the septic tank, there is less room for waste water to fill the tank. Even with a moderate amount of sludge in your tank, heavy system use can overfill the tank with waste water forcing solid waste out of the system before it’s had time to break down, clogging your pipes or backing up your system. To prevent this backup, use water efficiently. Spread out washing machine uses instead of doing all the family’s laundry in one day, take shorter showers, and install low flow shower heads. All water conservation efforts reduce the strain on your septic system. Speaking of space in the septic tank, all non-biodegradable material settles on the bottom with the sludge, making less space for waste water and waste material. Natural waste needs time to sit in the septic tank and break down. As a result, the tank is regularly full of waste materials and needs extra space to take in more while biodegrading what’s already there. The more non-biodegradable material in the tank, the further the pipes will have back-up to hold all the excess waste. Take up too much space in the tank and you'll be facing a clog. Ensure the life of your tank by only flushing natural waste and toilet paper into your septic tank. Pesticides, solvents, motor oil, paint thinners, and other harsh chemicals are toxic and should never make their way into your septic system. These chemicals will kill the bacteria needed to break down waste, and then filter it into your drain fields soil, killing the surrounding plant life. Never use your septic system to drain these chemicals. They will destroy your system and your yard. Detergent and other phosphates act as fertilizer to algae that grows in septic systems. Too much algal growth blocks filters in the distribution pipes of your system, and can lead to a backup. Make sure to not over use detergents in your washing machine, and only use liquid or gel soaps in your dishwasher - they are phosphate free. By minding these four tips you’ll avoid the most common forms of septic tank misuse, and ensure that you get the most out of your tanks natural life. A septic system is a necessary addition to homes that are not connected to municipal sewage lines or homes located in areas where such lines do not exist. Knowing how to take care of such a system is critical to maintaining well-functioning plumbing, which will allow you to minimize unpleasant surprises. In this guide, we will provide some useful tips on how to keep your septic system in excellent shape. First off, it is important to understand what a basic septic system consists of. The primary components are (1) a septic tank and (2) a drainfield. The septic tank is used to hold the household wastewater, and the drainfield helps remove impurities from the liquid. While the wastewater is in the tank, heavy solids settle down to the bottom, forming a layer of sludge, while light solids float to the top of the septic tank forming a layer of scum. The separated wastewater flows into the drainfield after it is pushed by a new portion of wastewater that comes from the house. Since problems with the septic tank can spread further down the system, it’s important to know how to take care of it. Heavy solids and light solids are accumulated in the septic tank where bacteria break them down. Unfortunately for homeowners, bacteria cannot break down solids entirely. This is why the septic tank has to be pumped every one to three years. The timeline depends on such factors as the size of the septic tank, the amount of generated wastewater, and the volume of solids in the wastewater. If too much wastewater flows into a septic tank, it will flow to the drainfields before solids separate. Solids damage the drainfield by clogging small holes in the drainfield pipes. This causes an excess of water to remain in the drainfield, breeding harmful bacteria. To control the usage of water, you can do many things, from installing a higher-efficiency toilet to avoiding leaving the water running while brushing teeth. As a rule of thumb, do not flush anything that can be thrown into the trash bin. This includes: kitty litter, chemicals like antifreeze, paints, pesticides, cooking oils, coffee grounds, diapers, hair, feminine hygiene products, etc. Plastic, for example, makes the septic tank fill up quicker. Chemicals can harm the bacteria that break down solids, and will harm the environment. It is always easier to deal with a problem when it is small. Inspections can identify problems at an early stage, which is why a timely one can save you a lot of money. Call a specialized and reputable company to do this for you on a yearly basis (a good one will also remind you of your annual checkup to make things easier). 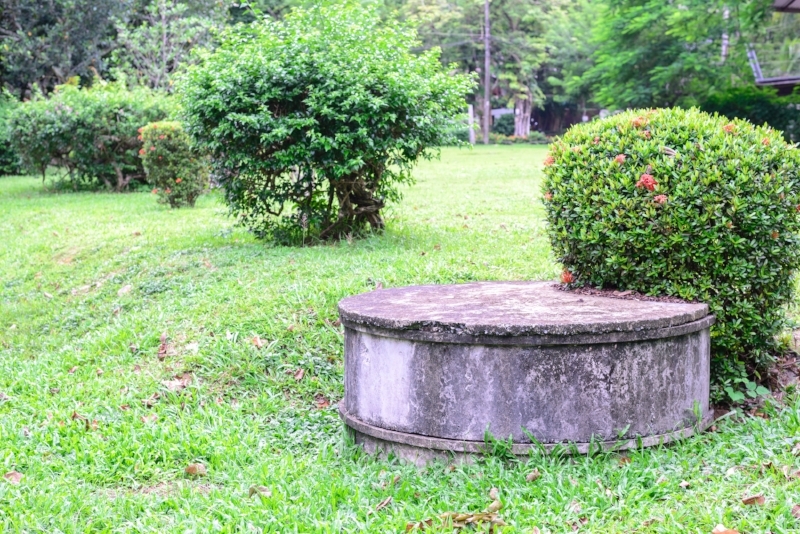 Faulty septic tanks can be the cause in sewer smell in the house or in your backyard. They may also be harmful to your family’s health (faulty tanks have been correlated with the emergence of a range of intestinal diseases in households). Check your tank regularly, save water, dispose of garbage correctly, and stay healthy. Using flushable wipes in your household could mean bad news for your septic system. The Huffpost Green reports that the FTC has called out Nice-Pak Products, Inc. for their unqualified claims about their “flushable” wipes. According to the article, when these wipes are flushed, they don’t break down as they should and can cause damage to septic systems and the environment. Read the whole article here to learn how the FTC is tackling the problem, and how you can help. “So-called “flushable” wipes are clogging plumbing pipes, septic tanks, and sewers in all parts of the world. Using keywords “wet wipes sewer”, take a journey through any search engine’s photo library and see a litany of appalling photos. Pounds upon pounds of these seemingly innocent products are causing plumbing and sewer nightmares and adversely affecting taxpayers and the environment. Read about the FTC’s decision for Nice-Pak here. Read the blog post from the FTC regarding Nice-Pak wipes here. Welcome to part III of this series on landscaping over your septic drain field. In this final installment, we will cover practical, handy tips that will keep you safe and save you the hassle of an overflowing leach field.